The Covered area is a column free 14644 m² (more than 157627 square feet) and width of 75m Exhibition Space, which conforms to International Exhibition Halls standards and practice. 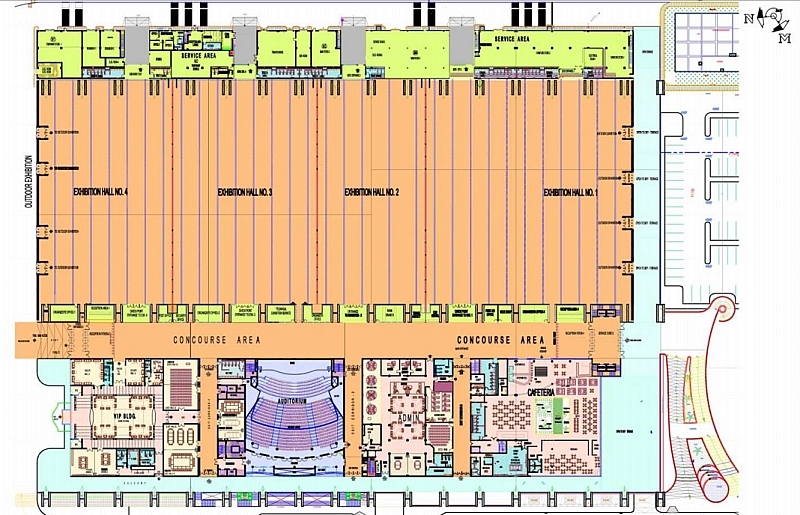 The Main Exhibition hall can be further divided into four (4) separate halls, with different sizes as required. The (4) Halls were designed to meet the requirements of any type of exhibition. These exhibition halls have adequate administrative support facilities and electromechanical services required separately for each hall. The exhibition hall floors were designed to take 5 ton / sqm of load tolerance and meets International Standards for Floor Loading. Under floor trenches with removable steel covers laid throughout the exhibition halls area provide easy & flexible electromechanical hook-up points for exhibitors. Design features of the Halls allow to hold a no. of exhibitions to be organized simultaneously in full harmony. Independent facilities are provided to each hall, such as; reception / registration, security services…etc. Warehouses, temporary storing area, loading and unloading areas are provided for exhibitors on the East side of Main exhibition halls. The elements of exhibition halls and all parts of the buildings were designed to allow natural interior light inside through the two main North and South entrances, and skylights.